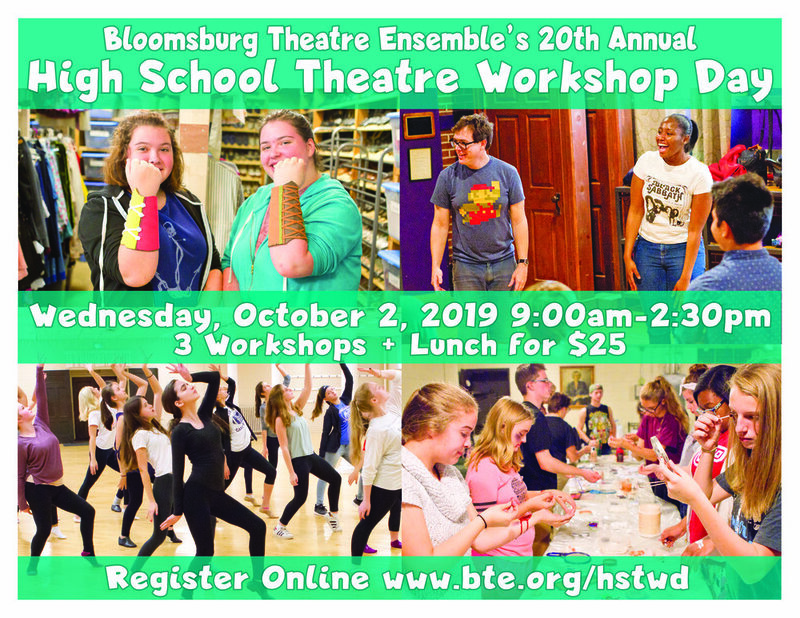 Each year high school students from all over the area converge at BTE to take three workshops taught by theatre professionals. With over 20 different workshops offered, students are able to customize their workshop experience. Offerings include acting techniques, dance, musical theatre, character creation, stage combat, special effects makeup, costuming, dialects, technical theatre, improvisation, and so much more. The event costs $25 and lunch is provided. Commemorative t-shirts are available for purchase. BTE is proud to partner with local organizations who allow us the use of their space for this exciting day! Organizations include Bloomsburg University, Bloomsburg Public Library, and the Caldwell Consistory. Additionally, Lucy’s Catering assists with providing excellent lunches for our staff and students.